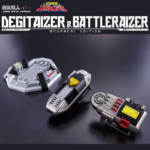 The upcoming release of the Super Sentai Artisan Degitaizer and Battleraizer from Denji Sentai Megaranger, better known as Power Rangers In Space for those of us who grew up with the Power Rangers, was originally scheduled to release in December of 2018. Unfortunately, due to what Bandai is calling a “production delay”, the item has been delayed with no current timetable for release. It should be noted that the previous Super Sentai Artisan releases – specifically the SP License from Dekaranger and before that the Aura Changer from Dairanger – have suffered from quality control issues resulting in entire production run replacements. 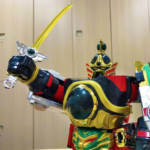 The Super Sentai Artisan Degitaizer and Battleraizer had recently had payment requests go out. This is the first time an item this close to release has been delayed. Super Sentai Artisan MegaSilver Keitaizer Announced! 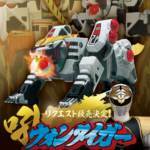 Another fun Super Sentai Artisan release is on the way for Denji Sentai MegaRanger fans! 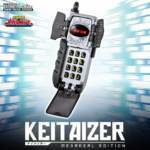 Premium Bandai has announced the next henshin device for the Artisan series- the Keitaizer belonging to Mega Silver! This new release will include updated show accurate sound-effects along with Silver’s signature background music. The Super Sentai Artisan Keitaizer will be released in February 2019! The price is a very modest 8500 Yen before shipping & handling. 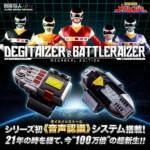 Super Sentai Artisan Degitaizer & Battleraizer Price & Release Details Announced! Bandai Japan has put up an official product page for the next entry in the Super Sentai Artisan line! This set is priced at 12500 Yen before shipping and handling! These MegaReal Artisan items are currently scheduled for release in November 2018! Rounding out our trifecta of Morphers, P-Bandai’s just launched pre-orders for the Super Sentai Artisan Master Licence, the main changer belonging to none other than Deka Master himself. 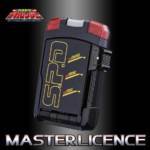 The Super Sentai Artisan Master License will retail for the same price as the other two versions: 9,936 yen. Pre-Orders will end on September 22nd 2017 with a final shipping date sometime in December the same year. In case you missed it, Bandai’s next entry in the Super Sentai Artisan line is, of course, going to be a modified version of the DX Won Tiger to accompany the Dairen’oh which sold out its pre orders already. 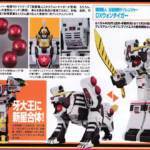 Ahead of the pre-orders going up, Bandai has revealed the Super Sentai Artisan DX Won Tiger in all of its glory! For now, all we have is this teaser image. Pricing and release date have yet to be announced as of this writing.